Beginning tomorrow, you can sing along with Idina Menzel and the rest of the cast during one of the showings of Disney’s Frozen Sing-a-Long. The Disney blockbuster’s soundtrack has been such a hit, that animators reworked the movie to include subtitles for each song. Sing with fellow Disney fans at one of the 2,000 nationwide theaters that are included in this limited time magical happening. Fandango now has all the details on theaters, showtimes and pricing. Want a little practice before the big day? Disney has released a Sing-a-Long version of the Oscar nominated, “Let It Go”. 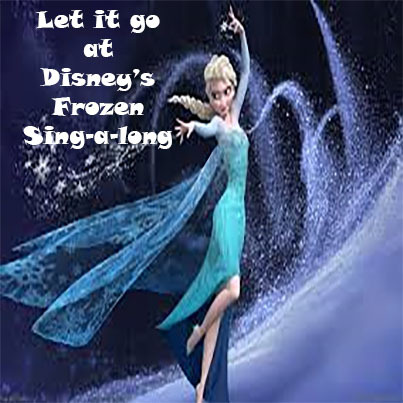 Sing along with Elsa…..twirl around….throw some popcorn in the air and pretend it’s snow. Get those vocal chords warmed up….because you have some singing to do this weekend. This entry was posted in Disney Movies, Uncategorized and tagged Disney Karaoke, Disney's Frozen, Frozen, Frozen Sing-a-Long. Bookmark the permalink.